“Singapore, are you ready to f**cking paaaartaaay?” screams Hardwell into the mic. 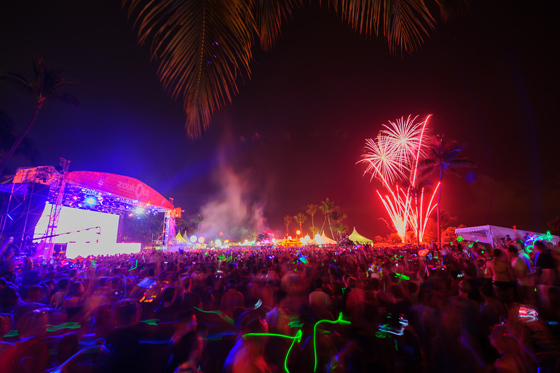 Nearly every single hand in the 10,000-strong crowd squished into the area in front of the Moon stage for the first night of the Zoukout festival — on the beach on Singapore’s Sentosa island — shoots into the air. People clamber on each other’s shoulders and fireworks explode on the front of the stage just as Hardwell drops Avicii’s ‘Fade Into Darkness’. A girl in a bikini top and shorts climbs on a guy’s shoulders and holds up a banner saying ‘go hard or go home’. It could be the catch-all mission statement for the night. It’s 11pm and stars are twinkling in an inky-black, cloud-free sky but the banner-waving girl isn’t the only one in swimwear. Almost half of the 20,000 or so people at this festival are wearing beach outfits of some description. Lots of them are barefoot, the rest are wearing flip-flops. There’s quite a few wandering around in blow-up, pink flamingo hats and the ratio of glo-sticks to ravers is at least two to one. Zoukout isn’t a new thing, it’s been happening every year for the past 12. What is new this year, is that they’re holding the festival across two nights instead of one. And the location — the tiny island of Sentosa, just a short bridge-hop from Singapore’s mainland (where Lincoln’s Zouk club is) — is hosting an influx of ravers from all over South East Asia, Australia, America and Europe for a whole weekend, instead of just one night. A sizeable chunk of those are fist-punching the air and stomping on the sand for Hardwell’s set. While the 24-year-old Dutch DJ cleverly laces an acapella of Psy’s ‘Gangnam Style’ over a pumping, bass-heavy slice of progressive house, on the second stage (the main is called Moon, the other one Star), Malaysian DJ/production duo Goldfish & Blink are pumping out similarly proggy 4/4 beats to a slightly smaller crowd. Blink & Goldfish are residents at Zouk in Kuala Lumpur, a franchise of the original. And, Blink says, their gig tonight is the first time Zoukout has had Malaysian DJs play on its line-up. While they play, percussionist Sudha (the long-serving Faithless drummer) is resting her hands after her stint playing bongos, congas and all manner of other percussion instruments alongside house DJ Hong, who’s the resident jock in Singapore. Sudha has played at Zoukout for the past couple of years. She is, she says, “excited about seeing Major Lazer tonight”. And no sooner has she uttered their name than they bustle past for their set on the Star stage. Diplo and Jillionaire are wearing suits. Walshy Fire is wearing a skip-cap that says ‘Lord’ and he’s holding the mic as he jumps up on a speaker stack. The two sassy Major Lazer lady dancers are wearing heavy black boots and lurid underwear, covered over with army shirts. The crowd is, at first, not quite sure what to make of this motley crew. Especially when they start mashing up tracks such as their own ‘Pon De Floor’ into carved-up slices of Beenie Man’s ‘Who Am I?’ and Harry Belafonte’s ‘Banana Boat Song’. As they play, the heat gets them and Diplo and Jillonaire take off first their jackets, then their ties, then their shirts. Diplo drops Nirvana’s ‘Smells Like Teen Spirit’ then mashes it into some dark dancehall, before playing the whole of Psy’s ‘Gangnam Style’. They might not have recognised most of the set so far, but when the crowd hears this, everyone shrieks and suddenly there’s a riot of dancing. Then Diplo stops the music. Five minutes later there’s a row of women — who’ve jumped onstage from the crowd — all doing upside-down twerking in front of the decks. “It’s just all booty,” shouts a guy in the crowd. At the other end of the beach, while Major Lazer head into their final, confetti-infused, supercharged flourishes, Above & Beyond are halfway through their set. It’s a DJ set, with Pavoo Siljamaki and Tony McGuinness playing. Progressive and pumping, they belt out prog-trance tunes alongside their own ‘Thing Called Love’, which nearly everyone in the crowd seems to sing along to. By the time the festival booms its way into silence, it’s past 4am. Twelve hours later, after a quick clean-up, the soundchecks start again. Then, a few hours after that, it’s all kicking off. He’s not playing till later, but halfway through Calvin Harris’s set, German trancer Paul Van Dyk turns up. Calvin’s set is admittedly a little on the “commercial” side, but when he drops Justice vs Simian’s ‘We Are Your Friends’, the crowd goes crazy. It’s hot. The stars are twinkling, and nearly all of the 20,000 people in the audience on the main stage are singing along. Next door, on the Star stage, Maceo Plex is in the final minutes of his set. When he plays his own ‘Stay High’, it’s one of those goose-bump moments. Sets by Nina Kraviz and A-Trak follow. And when the crowd seems to be waning in enthusiasm for Montrealer A-Trak’s hip-hop-infused house antics, he wins them back by dropping Stardust’s ‘Music Sounds Better With You’ and mixing this into his own, co-produced (with the mighty Armand Van Helden)‘Barbra Streisand' (as Duck Sauce). At around 6.30am the first strains of sunrise streak the black, inky sky with slices of lighter blue. The crowd has thinned but it’s still a packed-out beach. German techno producer Paul Kalkbrenner is playing, and everyone in front of the stage, in the beach bars and all over the beachfront is dancing. His 90 minutes pass in a disco flash and by the time Paul plays his final tune — his own heart-flutter-inducing, house mix of Tears For Fears’ ‘Mad World’ — the beach is flooded in full sunshine. There’s a muggy, intense heat in the air as Zouk resident Hong starts playing. Paul Van Dyk is finishing on the main stage and Singapore DJ Aldrin is taking his place. The heat rises in line with the sun as Hong plays deep, Latin-infused house. It’s getting close to the end — nearly 8am — and the stage has been invaded by the organizer Lincoln, his wife, the Zouk staff and, erm, DJ Mag. It’s like a 22nd-century scene from hippy movie Hair as the crowd and everyone on stage groove to Hong’s final tunes, including the mighty Todd Terje’s ‘Inspector Norse’. Just as the last few bars play out, a riotous thunder crack splits the sky. And, moments later, it’s pouring with hot, heavy rain. 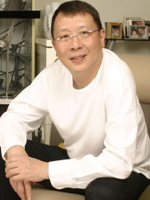 Zoukout’s curator, and the owner of Zouk, Lincoln Cheng was at the legendary Woodstock festival in New York state in 1969. So it’s safe to say he knows a bit about what makes a good festival. 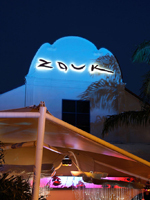 The inside of Zouk is decorated with original pop and contemporary art pieces, including Keith Haring’s final painting The Healing Hand and works by Andy Warhol and Haruki Murakami. The cocktails in Zouk are THE best club cocktails in the world. 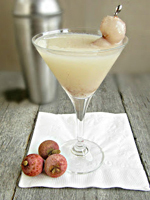 The venue’s infamous Lychee Martini is so tasty that Carl Cox allegedly drank 15 of them, on the trot, in the space of an hour on a recent visit. 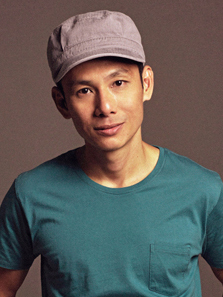 Before Lincoln opened Zouk, in 1991, he and resident DJ Jeremy Boon hosted parties called Warehouse at another venue in the city that started in 1989. They were the first-ever club nights playing house music to happen in South-East Asia. Lincoln is planning to open another Zouk club — “probably in Korea,” he says — sometime next year.